Soil testing is incredibly important when you’re planning to produce food from your yard. It tells you what you’ve got and what you need. Plants won’t give you their best if they don’t have the proper nutrients or proper pH levels. The three most common nutrients, referred to as macronutrients, that plants need are Nitrogen, Phosphorus and Potassium usually referred to as NPK. 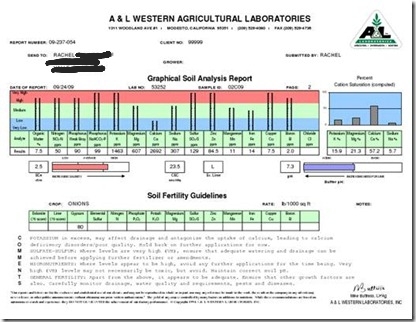 But NPK isn’t the only thing you need to know the levels of in your soil. Other important nutrients, or micronutrients, include magnesium, calcium (especially important for tomatoes, peppers and eggplants), manganese, and iron (especially important for citrus). It’s also important to know what your soil structure is and how much organic matter is in it. This affects your watering and plants’ ability to take up that water. High clay soils are more prone to run off and take longer for water to infiltrate, while sandy soils drain very fast and don’t hold enough water long enough for plants to access it. You can also find a soils laboratory through your county extension or local university. To determine the structure of your soil you can do a home test. All you need is water and a jar. Simply add 1 part soil to 2 parts water in the jar. Close lid and shake for 1 minute. Allow this mixture to settle. This can take between a couple of hours to a couple of days depending on your soil’s structure. The first particles to settle will be the sand since they are larger and heavier. Silt is the second particle followed by clay, which are the smallest and lightest soil particles. As you can see, where the 30% lines of each side of the triangle meet to form a triangle we are dead center in the Clay Loam category. Loam is considered the best balanced soil structure because it offers both optimum water retention and water drainage. Clay loam will not drain as quickly, but it retains water well. The most common and concerning soil structure is clay soil. Clay soil can be very difficult on plants as it doesn’t drain well and makes it difficult for water to percolate in. It also contains a lot fewer air pockets with roots need. If you have clay soil, your best option is to dig in a lot of organic matter. An easier option, however, is to forgo using this soil and just build raised beds.